It would be so easy to write a book about Tia, there is so much to say about this special girl. Tia loves affection and is so eager to please. 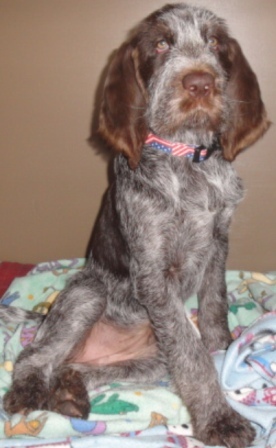 She is one of the sweetest Spinone girls you will ever meet with a very calm, but adament demeanor. She knows what she wants. Tia loves to hunt and swim and is a natural retriever, When she was only six months old she chased a duck into a lake and was in the water swimming tirelessly after it for a good 25 minutes. For awhile we thought we were going to have to go into the water and get her to come out. At 11 months Tia earned her AKC Good Canine Citizenship Certification and Prized III in NAVHDA with a total of 98/112 points. At one year old she recieved her AKC Junior Hunt Title. 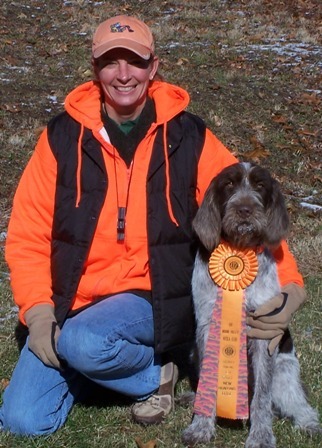 April 22, 2013 Tia earned her 4th and final qualifying leg for her AKC Senior Hunt Title. She earned all 4 legs, all in a row, with no misses. Tia is our first ever Spinone. she is the light of our lives here at home. We call her "Queen Bee T". She always makes sure everyone is in line, our take charge girl. 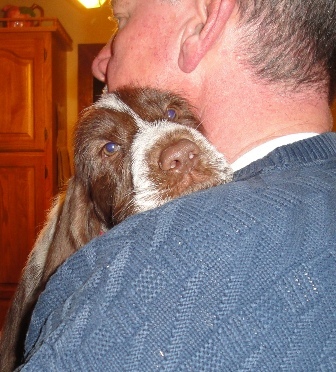 Tia has bought us some beautiful puppies over the last several years. Although she has retired from having puppies, Tia continues doing what she loves, hunting, searching for ducks, swimming and most of all making sure everyone here is "A" OK. We love our Tia! We call her Furba Fontana and what a special girl is she. It was love at first sight when we brought her home to live with us. All the dogs too instantly fell in love with her as she charmed her way into the pack. Soon she was out hunting just like the big dogs and took an instant liking to birds and water. When she was only 4 months old we led her to the water and she took off swimming like an otter. When all the dogs go out together for a run Furba is the first one to find the water hole and always the last to get out. She has a great nose and natural instinct and at the age of only seven months she ran her NAVHDA NA test and earned 112 points for a perfect score Prize I. 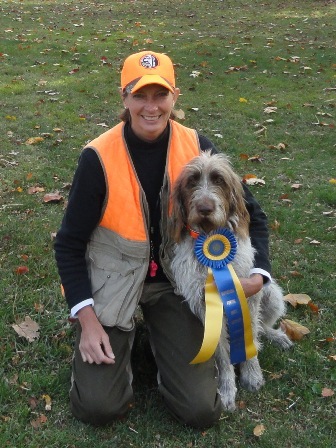 On October 30, 2011 Furba earned her AKC Senior Hunt Title, just 2 days before her 2nd birthday. At 4 years old Furba earned a NAVHDA Utility II. Furba and Rocco brought us puppies, Sara and Morghen that have stayed here with us. Furba is now retired from having puppies. width=33% Meet Jorja! Jorja comes to us from Germany from superb background and lineage. Both parents are out of Del Subasio kennel in Italy known for strong hunting lines, brains and beauty. Jorja has all of this to offer and more. She is a joy to have in our home and the perfect addition to our family, the charmer to everyone she meets. A natural retriever who always has something in her mouth when she comes to greet you. 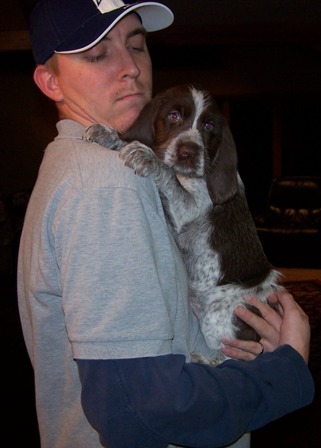 An outgoing bundle of love with lots of energy to go along with her high drive for hunting and her willing to please. She is gangbusters when it comes to swimming and it shows the way she enters the water so enthusiastically. At the age of 9 months old Jorja earned 98/112 points for a Prize III in her NAVHDA NA test. At age 3 yrs and 11 months Jorja earned 187/204 pts for a Prize III in her NAVHDA Utility test. In Spring 2016 Jorja earned her AKC Master Hunt Title passing 5 out of 7 runs. Jorja had her last litter the summer of 2017. She is now retired from having puppies.